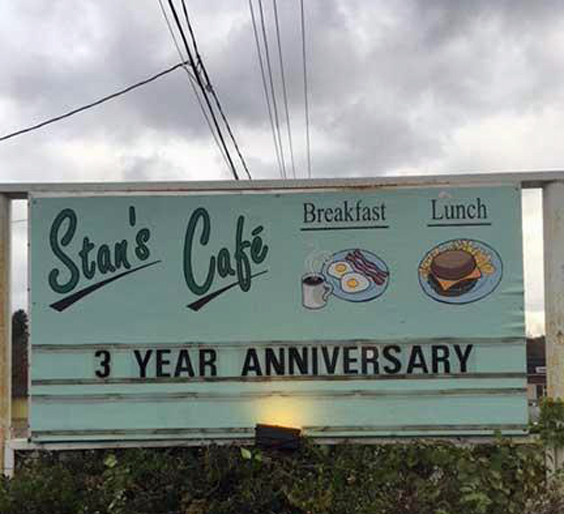 Today we were delighted to read in The River Reporter, Narrowsburg, NY that over in Honesdale, Stan and Michelle Rembish are celebrating the third anniversary of their cafe. The research we’ve done suggests we would be regulars in Stan’s Cafe if we lived nearby as it looks like our kind of place. Further research tells us that Stan and Michelle were able to launch their business in part thanks to a $2,000 raffle win. We wish them well and hope their luck holds. Yesterday two very different publications emerged featuring Stan’s Cafe content which, taken together, show the diversity of how writing about theatre is currently distributed. Marissia Fragkou has authored a book Ecologies of Precarity in Twenty First Century Theatre. It’s always exciting to find a book whose title causes you to reach for a dictionary, especially when that dictionary doesn’t help at all. It seems the term precarity (which presumably prevents you having to get ugly with precariousness), wasn’t massively in use 39 years ago when I started secondary school and my parents gave me the edition of The Little Oxford Dictionary which still sits beside me ameliorating my poor spelling. Marissia’s book is published by Bloomsbury Methuen and currently marketed at University Libraries (RRP £75 but at the time of writing available from the publishers for £52.50) hopefully the paperback will be out ready for people’s Christmas stockings next year. Marissia is a good incisive writer so this volume is certainly worth checking out by those interested in the contemporary theatre scene. By contrast Tracey Crossley and Niki Woods have edited Making Post Dramatic Theatre: A Handbook of Devising Exercises a couple of which are ours. This publication is exclusively available on the subscription based online platform Digital Theatre. It is targeted at young theatre makers or teachers of theatre to give them ideas for their own practical work. Once again The Little Oxford Dictionary doesn’t help but it is excused as Hans-Thies Lehmann’s seminal Postdramatic Theatre (which cites Of All The People In All The World as piece of such theatre) was only published in 2006. By way of further contrast Devising Theatre With Stan’s Cafe, written with our collaboration with Mark Crossley (no relation of Tracy as far as we know) remains a massive compromise. There’s no dictionary challenging title, it’s for theory AND practice people, it’s out in old school expensive hardback, new school cheaper paper back and future school e-book with a non-subscription website based supplement. If you’ve not yet had enough contrasts there are the 21 new Stan’s Cafe titles we are looking to publish in the next 12 months, but they are the subject of a blog post that’s yet to be written. Some of you will know this story, you’re savvy enough to stop reading if you have. In 2005 a group of students graduated from Birmingham University and decided to form a theatre company. After much fraught discussion they decided to call their company Kindle. I don’t know for a fact that the discussion was ‘much’ and ‘fraught’ but whoever named their enterprise with speedy decisive assurance? Anyway, the point is they called themselves Kindle, they worked hard, started making shows, and became successful. In parallel with this story is one about a graduate of Princeton University who, in 1994, decided to form an online book retailer. After ‘much fraught discussion’ he decided to call his retailer Amazon. He worked hard, started selling books and became successful. In 2005 Amazon started work building an electronic book called Fiona. After some time it became clear that the e-reader could be great but that its name was rubbish so after much engaging of branding consultants they decided to call it Kindle. By the time millions of Kindles were being sold around the world Kindle started to get fed up of sharing their name with an e-reader and all the questions and misunderstandings that involved. They decided to change their name. Despite very little engaging of branding consultants they still came up with the name Kiln, a neat choice I’m sure we will all agree. In parallel with this story is one about a graduate of Hull University who in 2012 takes over Tricycle Theatre in Kilburn, London. After working hard, making shows and being successful, the director leads Tricycle Theatre to a major refurbishment. After ‘much fraught discussion’, but possibly not very much ‘web-searching for to see if a theatre company already exists with the name you’d quite like to use for your theatre company’, she/they decide to call it… and here you’re all ahead of me – Kiln. So poor old Kiln were called Kindle before Kindle and now they’re called Kiln before a much richer, more established and more prominent theatre based in London decide to be Kiln. Where from here? Well Kindles are still called Kindles. Kiln complained to Kiln about the name Kiln, but Kiln really didn’t seem bothered about it at all – whereas Kiln, as you can imagine, are really quite bothered about it. So Kiln aren’t going to change their name, particularly after an expensive rebranding, despite sniffy columns and comments in The Guardian which also include numerous people saying what a rubbish name Kiln is! This just leaves Kiln who have decided to disband, not because of the whole Kiln thing, but because as a collective they felt they’d run their course and want to continue working in theatre as individuals. So if Kiln are disbanding does any of this matter? Well, The Tricycle didn’t know Kiln were disbanding when they decided to cohabit their name – maybe Kiln didn’t know they were disbanding at that point, so there is a lack of respect in the decision, which is upsetting, original Kiln are sinking in the search engines swamped by new Kiln. On 22nd September Kiln are holding a valedictory walk from Birmingham University to a pub somewhere across some hills, I hope to join them and celebrate their achievements and wish them luck with whatever they do next – whatever they may call themselves. This weekend saw the return of Lunar Festival after a year off. Having worked the 2015 as The Commentators it was a pleasure to return not working but as the punters. Although cloud cover prevented us from seeing Friday night’s Blood Moon phenomena in the sky the Lunar stages presented plenty of alternative phenomena to gape at in awe. Saturday’s more overcast weather was adroitly mirrored by a darker musical programme that opened with Matters, my pick of the festival. Although I absolutely loved Amadou and Mariam ultimately they are a bit too cheerful and exotic to be my pin-ups, driving epic paranoia from Birmingham has to carry the day for me. I looked after bags while lots of people went to hear Ed Miliband do whatever he does now. We caught Untied Artists blowing cobwebs from their Acorn Emporium children’s show before it arrives at mac in August. Barbara Nice was audible in the distance running a version of Blind Date. I caught what looked like a dad and two very young sons played a punk set and Ouse Valley Singles club playing a pugnacious skiffle set. We ate Persian food, didn’t feel the need for any of the ‘healing’ or craft activities on offer, slept past the 8am kids cinema showing on offer by Flatpack and sheltered from the rain. Blackash concluded their intense set with cheerleaders and a gorgeously back lit Goldfrapp wrapped Saturday-up with an rich and assured performance. A triumphal return for Lunar, next up, in early September comes the Moseley Folk Festival for which The Commentators return.